THE IRON CURTAIN between the two Germanys has received a fair share of public attention in recent years. 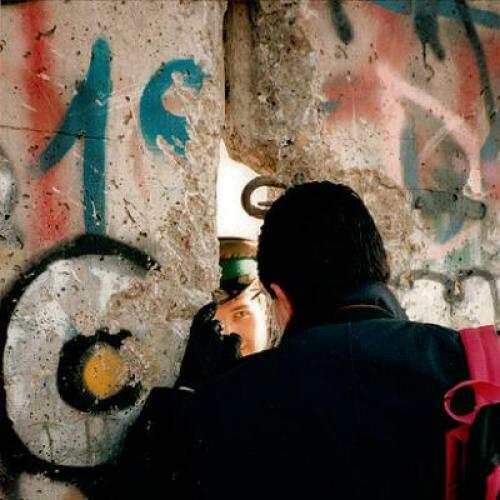 The twentieth anniversary celebrations of the fall of the Berlin Wall constituted a high-profile event back in November of 2009, and the fiftieth anniversary of the erection of the Wall in August of 2011 also registered in the media, particularly in Germany. These recent commemorations have perpetuated long-standing historical patterns: the Berlin Wall was the most visible part of the Iron Curtain and the most widely recognized symbol of Europe’s division even during the Cold War, but the Berlin Wall constituted only a small part of the border that divided the two Germanys—a point made by Edith Sheffer in this interesting book. Beyond that bustling metropolis, the German-German boundary stretched through nearly 1,400 kilometres of mostly rural terrain, although this part of the European East-West frontier never received the same kind of public attention. Sheffer aims to redress that balance and to examine the emergence, the persistence, and the ultimate collapse of the inter-German boundary along the so-called “green border,” far from the political nerve centres of East and West Berlin or Bonn. Sheffer adopts the methodology of a local case study. Her book is essentially an in-depth examination of a particular—and very peculiar—locality at the inter-German border: the twin towns of Sonneberg and Neustadt in southeastern Germany, on the border between Bavaria and Thuringia. Between them, the two towns had a population of roughly fifty thousand and a shared history of centuries of close interaction, which was rudely disrupted by the political and administrative arrangements imposed on the area after Germany’s defeat in 1945. The East-West dividing line between the American and Soviet occupation zones—originally drawn for what were meant to be merely temporary, administrative purposes—ran between the two towns. It split the historic Burned Bridge of the book’s title that had traditionally linked the two communities, leaving Neustadt in what ultimately became the Federal Republic and Sonneberg in the German Democratic Republic (GDR). Sheffer sets out to trace “the rise and fall of the Iron Curtain” in this location and, through that endeavour, to pursue an ambitious wider agenda as well. According to her, the book “challenges the conventional image of the Iron Curtain in Germany. The physical border between East and West was not simply imposed by Cold War superpowers but was also an improvised outgrowth of anxious postwar society.” Sheffer stresses the dynamic nature of the border, pointing out that the heavily militarized and seemingly immutable fortifications that marked the German East-West frontier by the 1970s and ’80s emerged only gradually and rather haphazardly from the rudimentary zonal barrier established in the early post-war years. Sheffer also “contests traditional views of Germany’s Iron Curtain as unilaterally imposed by the East,” highlighting ways in which Western actions, too, helped to consolidate the barrier. Sheffer divides her study into three parts, each of which covers a particular chronological period and comprises several thematically organized chapters about specific borderland issues. Somewhat predictably, the first section focuses on the years from 1945 to 1952, when the inter-German boundary was still relatively permeable. The second takes the story forward to the period between the spring of 1952, the point at which the GDR began to seal and militarize the borderline in earnest, and August 1961, when the building of the Berlin Wall closed off the last major westward escape route from East Germany to the West. The last section, in turn, addresses the era of the Wall and of the full-blown Iron Curtain, from 1961 to 1989. It also contains an epilogue of reflections on changes in the Sonneberg-Neustadt region since the GDR’s collapse and Germany’s unification in 1989-1990. In many ways, this extremely well-researched book is a model of the genre. Sheffer has scoured numerous archives, interviewed dozens of eye-witnesses, and ploughed her way through a small mountain of published materials to explore what happened in the region. She writes clearly and robustly, with a good eye for the interesting anecdotes and other illustrative details with which she repeatedly spices up her prose. Her book is a major contribution to the social history of the inter-German border. Its findings highlight the increasingly militarized boundary’s dramatic impact on the lives of local residents better than any existing study has, and she also succeeds in showing how the area’s population helped to shape some of the local realities in the border zone. The book’s first few chapters, for example, demonstrate very convincingly that the early consolidation of the East-West border line in Neustadt-Sonneberg was facilitated by the widespread popular perception on both sides of the barrier that East-West demarcation line had turned into a wild frontier of chaos and criminality that needed to be brought under control. But Sheffer is less successful in her attempts to reinterpret the bigger political story of the rise and fall of the Iron Curtain. The social history of the particular border region that she narrates so ably and engagingly remains largely detached from higher-level politics. To be sure, many of the chapters begin with a brief overview of the bigger political context in Bonn, East Berlin, and the wider Cold War world, but the author never makes a sustained, systematic attempt to connect her local analysis to that of decision-making about the inter-German border at the national and international levels. As a result, her stated intention of underlining the importance of local-level events and actions for the bigger Cold War story of the rise and fall of the German-German boundary remains largely unfulfilled. It is undoubtedly true that local actions influenced local events and developments at the border. But the book’s findings suggest that the agency of local actors remained quite limited. The broad goals, principles, and policies that determined how the border was to evolve were set elsewhere, at higher levels, and although local actions could certainly complicate their implementation, and occasionally even provoke particular responses from higher political authorities, the bigger power dynamic flowed primarily from the top down. No level of local defiance could thwart the GDR’s drive to seal the border increasingly hermetically, particularly from 1961 onwards, and the seeming solidity of the local border arrangements quickly lost all relevance as the wider East German system crumbled and collapsed with shocking speed in late 1989. Yet Sheffer’s book is a powerful social history of the inter-German border that insightfully and convincingly examines the experiences, perceptions, and mentalities of “average people” on both sides of the barrier during the four decades of Germany’s Cold War division. It was those average people who had to live through the division of their country, and on one side of that division, they had to do so without any experience of democracy. It is unfortunate that they were so rarely active designers of their own fate, and so often the playthings of power politics. Pertti Ahonen is a senior lecturer in European History at the University of Edinburgh.